At this point, you may be wondering why Speed Queen is almost double the price of Whirlpool. Is it worth another $400+ dollars? Perhaps. We will look at both companies, the products, compare and then answer the question. First, you may want to consider a front load washer. It is bigger, more efficient and uses far less water. It even spins faster for less time for less drying time. Now you are considering a top load, perhaps because you do not want to bend over to add/remove clothes from the machine. Top load washers are better for that. They can also be less expensive to buy (yet way more expensive to operate). However, if you are buying for reliability, there is only a 2% difference according to our internal service numbers. You can read them both in the links below. It's important to consider all your options. That said, let us look at both companies. Speed Queen was founded in 1908 and has been under a few different companies. In the 1980s, they were based in Massachusetts as a subsidiary of Raytheon. Speed Queen is currently a subsidiary of Alliance Laundry Systems and is based in Wisconsin. They were the first to introduce nickel-copper tubing in washing machines, therefore revolutionizing the way laundry was done. Their main business is commercial laundry, but their recent residential machines are built on the same platform. The basic Speed Queen model features a 3-year warranty instead of one year like most other brands. Because they are built on a commercial platform, they are built with stainless, not plastic parts. Commercial machines have to be built to a better standard to absorb the abuse (remember your college days, they take a beating). Even the tub is fitted with a stainless steel tub that can fill up entirely with water for a proper soak and/or a good old fashion deep tub wash.
At 3.3 cubic feet, there is plenty of room for the whole family’s laundry. It has a maximum speed of 710 rpm or revolutions per minute. Whirlpool, on the other hand, is a giant compared to Speed Queen. The Michigan-based company is currently the largest manufacturer of home appliances with several manufacturing facilities in over five states. 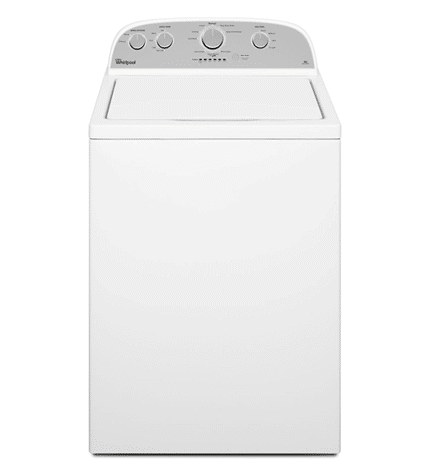 Founded in 1911, the company started out primarily as a washing machine manufacturer. The company currently owns brand names like KitchenAid, Maytag, Amana, and Jenn-Air. 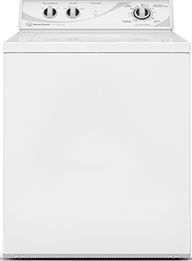 The basic Whirlpool model WTW4815EW above costs $429.99 (just $30 higher than in 1987), has a one year warranty and is 3.5 cubic feet. The tub basket is made of porcelain and spins out at 700 rpm max. It has 5 different water temperature controls and 4 washing cycle options. For controls, the Whirlpool also has dial knobs for mechanical control and a simple to understand display just the same way it probably did in the 1940s. Although top loads are older technology, they both work well. Without question, Speed Queen is a built better machine throughout. The stainless tub will wear better, and it should break down less. Speed Queen is the best top load.  However, it is double in price to the decent Whirlpool without much in terms of operational efficiency. So its reliability and build quality versus price. For $849, you may want to consider a front load machine. Want to learn more about the latest washers (not these)? 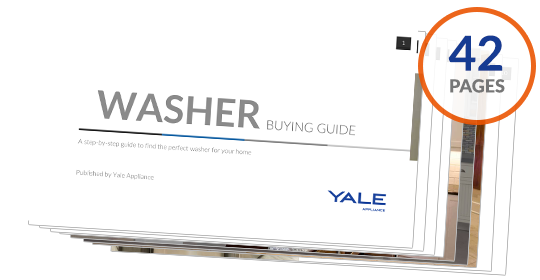 Get the Yale Washer Buying Guide with features, specs and detailed profiles of every brand. Well over 185,000 people have read a Yale Guide.